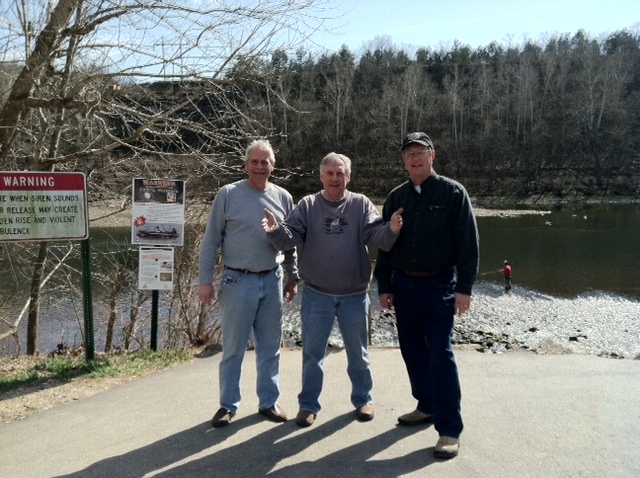 Yours truly (center) demonstrates how big the trout was that he caught but eventually let go during a fishing trip to Branson, Mo., with buddies Bob Montgomery (left) and Pete Oppermann (right). The demonstration may be a bit exaggerated. A small break in the legislative window was all that District 26 Rep. Bob Montgomery, R-Olathe, needed to get away for a day-and-a-half of fishing this past weekend. And he didn’t have to ask twice for Olathe landscape architect Pete Oppermann and me to tag along for a quick jaunt to Branson, Mo., and Taneycomo. We were on the road before 5:30 last Sunday morning. It was a great sunrise and with traffic light we were making good time while talking politics, fishing, and about our lives in general. There’s been a lot said and many articles written about how the federal government, and more specifically President Obama, is trying to force faith-based institutions, specifically those operated by the Catholic religion, to provide health insurance that covers abortion and free disbursement of contraceptives to employees. Message to congress: DO SOMETHING, DAMN IT! Words cannot express the anger, the frustration and how immensely powerless Americans are feeling as they watch and experience the economic pressures thrust upon them by the gouging of oil and gasoline prices at the whim of big oil companies. There are many things wrong in this world. There are a lot of injustices. But the one thing that makes my blood pressure rise and gets me red in the face is the price-gouging schemes of oil companies and the government’s do-nothing attitude to control oil-profit greed. Call it my pet peeve, but oil company greed has become blatantly obvious the past several years. Parents who have ever read Mike McClintock’s “A FLY WENT BY” to their children probably didn’t realize it, but they pretty accurately were explaining the great economic downturn that has gripped America these past few years. For those not in the know, in the young children’s book a fly thinks it is being chased by a frog that is being chased by a cat that thinks its being chased by a dog that thinks, well, you get the idea. Every action triggers a reaction that starts another action. A couple in their 90s and married 62 years walk into their local clinic and, well, you just have to watch this. It’s amazing how an election year can bring about bi-partisanship legislation. Republicans and Democrats, TEA Party folks and Libertarians, Catholics and Baptists, it’s great to see them put down their ideologies and push aside their individual agendas to put their arms around each other and pass a bill that enables them to go home and campaign to their constituents that they put party politics aside to do what’s best for the people.